Synopsis: A New York Times bestseller! The Sandman is the universally lauded masterwork following Morpheus, Lord of the Dreaming--a vast hallucinatory landscape housing all the dreams of any and everyone who's ever existed. Regardless of cultures or historical eras, all dreamers visit Morpheus' realm--be they gods, demons, muses, mythical creatures, or simply humans who teach Morpheus some surprising lessons.The binding is a “smyth sewn binding”. In this epic tale, Delirium, youngest of the Endless, prevails upon the Sandman to help her find their errant brother, Destruction. But their quest will lead to a painful reunion between Morpheus and his son, Orpheus. Then, the Sandman and others are trapped in a mysterious inn while a tempest rages - and all they can do to while away the time is tell the stories of their lives. And when a young woman's baby is stolen, she turns to The Kindly Ones for vengeance - only to set off a series of events that will lead the Sandman to his ultimate fate, and the baby to find a destiny no one could have foretold. 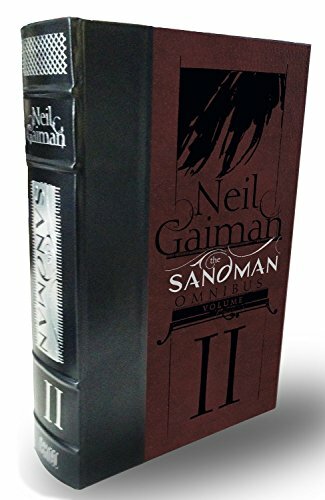 This massive hardcover tome, over 1000 pages, collects the final 38 issues of Neil Gaiman's groundbreaking series. Collects THE SANDMAN #38-75 plus stories from VERTIGO JAM #1 and VERTIGO: WINTER'S EDGE #3. About the Author&colon; Neil Gaiman is the New York Times best-selling author of the Newbery Medal winning The Graveyard Book and Coraline, the basis for the hit movie. His other books include Ananasi Boys, Neverwhere, American Gods and Stardust(winner of the American Library Association's Alex Award as one of 2000's top novels for young adults) and the short story collections M is for Magic and Smoke and Mirrors. He is also the author of The Wolves in the Walls and The Day I Traded My Dad for Two Goldfish, both written for children. Among his many awards are the Eisner, the Hugo, the Nebula, the World Fantasy and the Bram Stoker. Originally from England, he now lives in the United States.